Sonya brings a successful 30-year career in fundraising to the field of philanthropy. Along with her husband Tom, she co-founded the Campion Foundation and recently added the Campion Advocacy Fund (501c4) to strategically advance the organization’s focus on permanently preserving wilderness, ending homelessness through advocacy and systemic change and strengthening the capacity of the non-profit sector. She works to leverage change in many ways: as a leader in Funders Together to End Homelessness, a national network of foundations supporting strategic grant making and advocacy to end homelessness; founding Philanthropy Northwest’s Capacity Building Learning Circle, a network of 70+ northwest foundations committed to strengthening the nonprofit sector; and launching the Stand for your Mission Board Advocacy Campaign with BoardSource to mobilize Board members for effective social change. She is currently working on state and national campaigns to end youth homelessness. 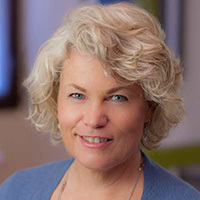 Previous to her work at Campion Foundation, she served for 18 years as Vice President of The Collins Group, a regional fundraising consulting firm, working with over 100 organizations and raising over $500 million in capital and major gifts campaigns. She is a national trainer and speaker on catalytic fundraising and innovative philanthropy and is committed to strengthening the fundraising profession by founding several educational and training opportunities with Association of Fundraising Professionals (AFP) in order to leverage more effective philanthropy. She is one of the rare professionals to be honored both for her lifetime professional leadership in fundraising (AFP Professional Achievement Award) and then a few years later with her husband Tom as AFP’s Philanthropists of the year in recognition of their catalytic philanthropy. In 2014 and 2015 she was named to NonProfit Times Top 50 Power and Influential leaders in the country and a “Woman of Influence” by the Puget Sound Business Journal. Ms. Campion serves on the board of directors for Seattle-King-Snohomish County YWCA, Whitman College Board of Overseers, Funders Together and Independent Sector. She holds a B.A. in psychology with a minor in political science from Whitman College, and can often be found in wild, natural settings, from the Methow Valley to the Arctic National Wildlife Refuge.